Today’s card is for the Less is More Challenge in collaboration with AAA Cards. The challenge is a one-layer card with a colored card base. I white embossed an old toile stamp set onto a navy card base. Though you can’t really see it in the photo – especially as the open spaces are just too small – I did color the flowers a pale pink and the leaves a pale blue. This entry was posted in cards, Stampin Up and tagged olc by karen h. Bookmark the permalink. How beautiful! I love the placement for your flowers and the stamps themselves are so pretty -gorgeous card! Thanks for joining us at Less Is More Challenge! Gorgeous! Really elegant and very stylish. Thanks for playing at AAA Cards. Beautiful card! I love the white embossing on the navy background 🙂 Thanks for playing at AAA Cards. 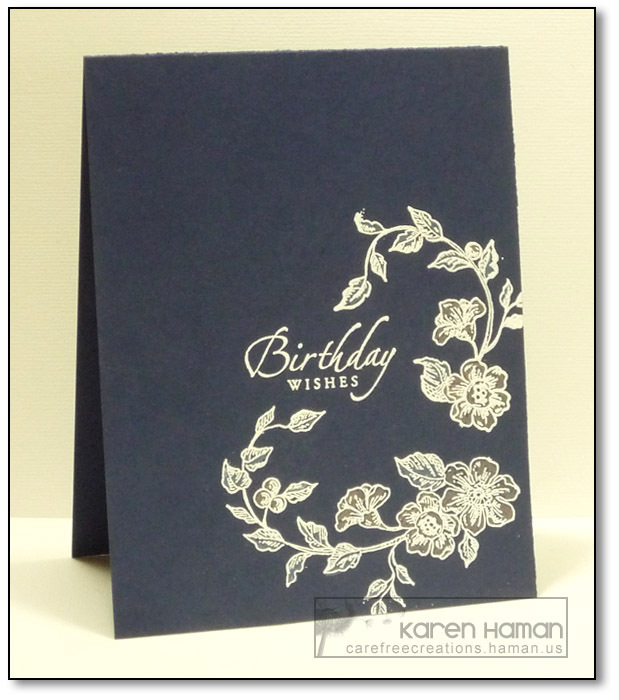 Such pretty embossed blossoms on the blue cardbase. Thank you for sharing with us at AAA Cards.